Construction on the K-8 campus is progressing with the initial site work now complete. The foundation work is beginning and the goal is to be under roof by next winter. The opening of the middle school is planned for the start of the 2019-2020 school year, with the new elementary building scheduled to open by mid-school year. As the construction continues, we are working to help our students and teachers prepare for success in the new buildings. Model 21st-century classrooms have been established at both Munroe and Tallmadge Middle School. We want to determine what works best now so that we have the tools and resources in place when the new buildings open. A model classroom will be created at Dunbar this summer so every teacher can experience a 21st-century classroom setting before moving into the new buildings. With the new buildings, our top priority is to create safe places for our students to learn. These new buildings afford us the opportunity to include state-of-the-art security features in the initial construction. These features will allow us to enhance the safety and security of our students. Turning to athletics, the design and construction team is now on board as we work to determine the best phased schedule for the project. As promised during the bond issue campaign, the total cost of creating the athletics facility will be shared with donors and other partners. We are working to craft a scope and schedule that creates opportunities for partnerships while ensuring the new stadium is available to use in Fall 2019. Please keep checking back to this page. We are providing updated construction drawings, floor plans, schedules and other project news as they occur. Thank you again to our great community for your continuing support. 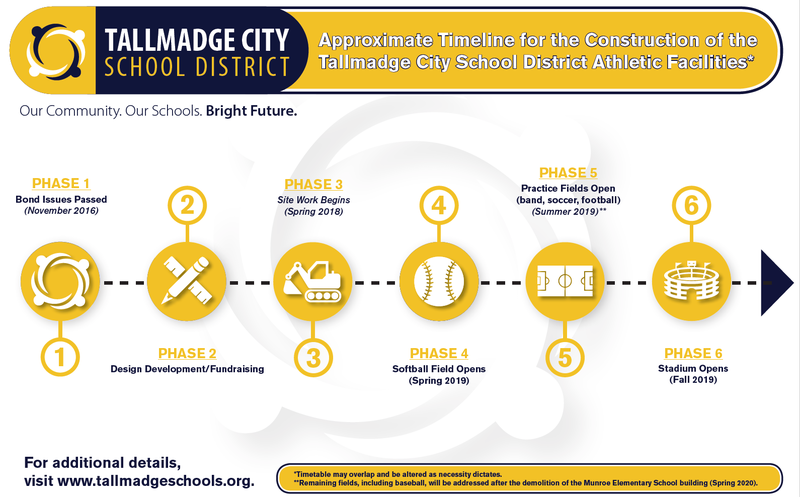 The future of Tallmadge City Schools is very bright.